at least when they're useful, cool and we get to make them in series. 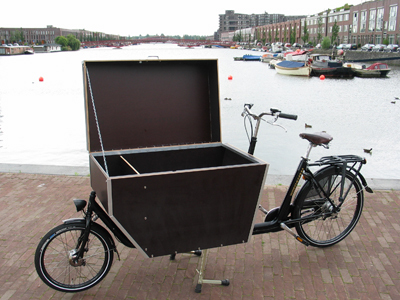 Here are some photos of the latest version of the Workcycles Cargobike Delivery, based on the now famous Bakfiets.nl Cargobike child-carrier frame. This is one of a series of five Cargobike Delivery bikes for London organic delivery restaurant Farm UK. Farm UK makes sandwiches, ciabatta rolls, bloomers, salads, drinks and cakes entirely from UK farm sourced ingredients. They're apparently super "lekker" though I always thought a "bloomer" was something old women wore while playing tennis. Regardless of what tasty bits Farm UK puts in their sandwiches and salads, they deliver them by bicycle. Feeding entire office buildings requires loads that normal transport bikes can't dream of carrying, but getting through downtown London's urban jungle on a three-wheeled delivery bike would be an exercise in frustration (though still not as bad as with an automobile). Thus we've built Farm these supersized Cargobike Delivery bikes. The boxes are made from an extremely tough and water resistant treated plywood normally used for concrete molding. Its called "betonplex" here in the Netherlands. Its very hard and stiff so we're able to keep the walls quite thin and light. The box has a hinged and locking lid to keep the goods safe and dry while Mr. Sandwich Salesman is making his deliveries. Dom and Ben from Farm UK have promised to send pictures of their bikes in action, complete with their Farm UK livery. Perhaps this post will spur them on to stop being productive for a few minutes and get that camera out. This special transport bikes looks great! You have nice pictures. These bikes can be very useful for deliveries. Thanks for sharing your post! How much does it cost? It also depends what kind of touring or activities you are engaged to. But i would love to have one of those! Looks cool and fun!